The new Summer Coffee Pale Ale is a warm-weather counterpoint to last year’s Coffee Porter. It wasn’t that long ago — September 2017 — that we were talking about a Dunkin’ first: That’s when the donut chain first decided to officially collaborate on a beer. Well, what a difference 19 months makes. 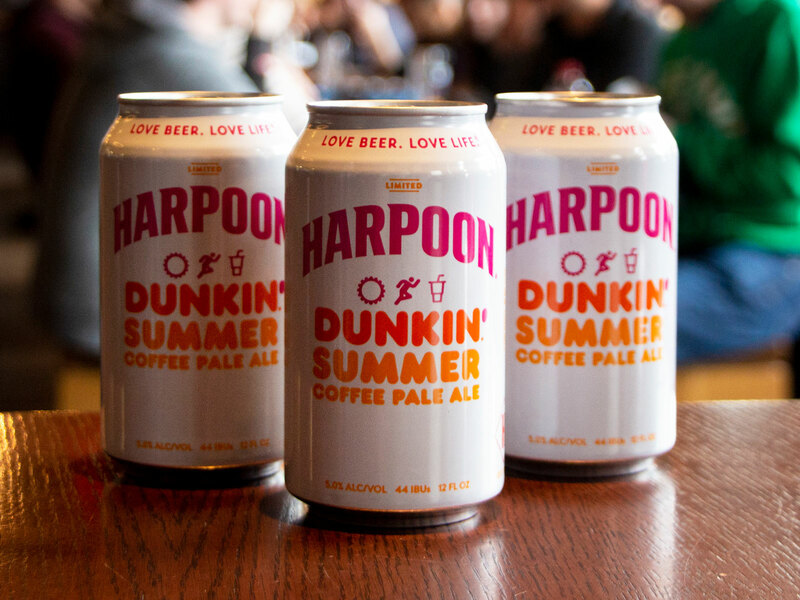 After teaming up with a couple smaller breweries, last October, Dunkin’ collaborated with Harpoon Brewery, America’s 18th largest craft brewer which also happens to be based in Dunkin’s home stomping grounds of Boston, Massachusetts. After that first Harpoon Dunkin Coffee Porter, now it looks like it’s off to the races: The two brands are working together again, this time on a coffee pale ale. The two Massachusetts-based brands said they decided to work together again after their initial porter proved “extremely popular [with] millions of pints served within the regional brewery’s distribution footprint” (which for the record, is 25 states strong including every state on the Eastern Seaboard and a handful of places further west like Texas and Minnesota). “We saw so much excitement and passion for our partnership last fall, and we’re thrilled to delight our fans who start their day with Dunkin’ coffee and end it by enjoying one of Harpoon’s famous craft beers once more with the introduction of new Summer Coffee Pale Ale,” said Dunkin’ U.S. Chief Marketing Officer Tony Weisman. Though coffee tends to naturally accentuate the roasted, sometimes chocolatey flavors of dark beers like porters and stouts, pale coffee beers — like Koffee Kolsch from Arizona’s Huss Brewing — have become increasingly common, and popular, in recent years as a delicious counterpoint. Granted, the combination doesn’t work for all palates, but you also might be surprised by how well these flavors can play off one another.